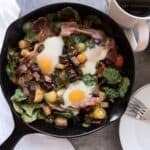 I love a good breakfast skillet! This one is full of tasty veggies, lots of flavor, prosciutto and eggs! So good! 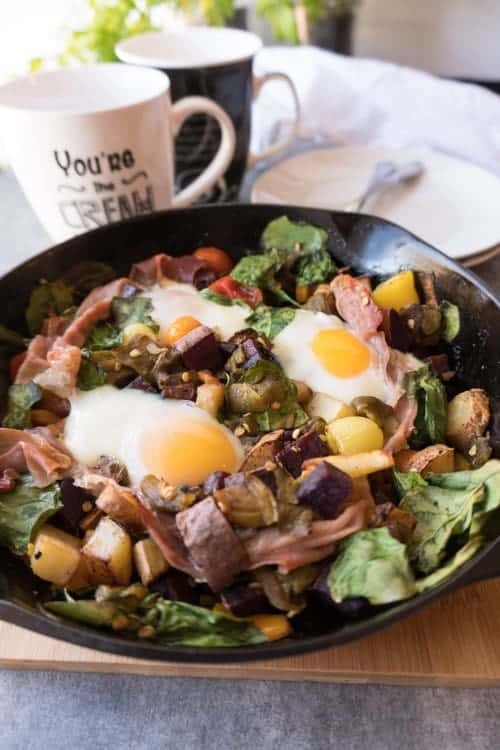 A healthy breakfast skillet is so fun to make! I think they are really pretty too. I love that the eggs get baked on top and the whole dish comes out so colorful! When I first saw a cast iron skillet breakfast, with baked eggs and prosciutto, I knew I had to try to make one! I wanted to use sweet potatoes, because I love them, but you can totally use russet potatoes instead. My favorite sweet potato is the white variety, which can be a little tricky to find. We just got a Sprouts grocery store and they always have them and a few other varieties of sweet potatoes- including the purple ones, so I am a happy camper! Aren’t the purple sweet potatoes gorgeous! I love that God created so much colorful food for us to eat! Anyways, purple sweet potato recipes are awesome and I can’t wait to share this one with all of you! So, in addition to the sweet potatoes, I added some other colorful veggies including bell pepper, a variety of small tomatoes, and spinach! I love using spinach in anything I can get away with. It’s packed with nutrients and hides easily in foods. And of course I had to add green chile. It’s kind of what I eat on everything…. But if you don’t have any it’s okay. If you do have some- think about making a green chile sauce in lieu of add the green chile to the dish and then pouring it over the breakfast skillet when you are done! Sooooo good! You can get my green chile sauce recipe here! 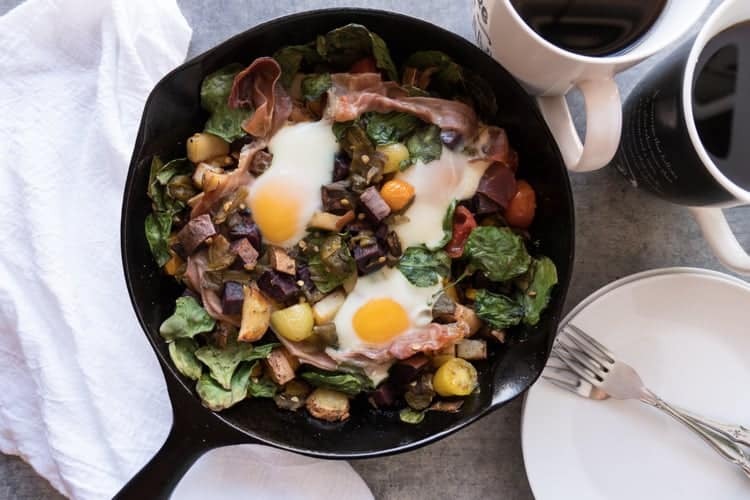 When I first made this skillet breakfast I was so excited because it looked beautiful, it had prosciutto in it and was full of yummy veggies! I have learned a few things though, that I want to pass on to you! Don’t overcook your potatoes on the stove top. I did this the first time and then the potatoes were a little too mushy after they were done baking. Still yummy, but not quite what I was going for. You can always take the eggs out of the skillet after they are baked to your liking and cook the potatoes in the oven longer if you need to. You can add different veggies! Anything in your fridge that you want to use up! Try mushrooms or zucchini! The eggs took a little longer than I thought they would to cook. Eggs baked in the oven have a different texture than a fried egg. You are probably think- duh! But I didn’t know this and so when I cut into one the first time I was surprised, that’s all. It still tastes delicious and like and egg! I love pouring salsa or my green chile sauce over this. Here in NM, we smother so much of our food in sauce and so that’s what I’m used to! I find if the potatoes are a little over done or the veggie combo didn’t meld as well as I would’ve liked, adding some salsa or green chile sauce goes a long way. If you can’t find prosciutto, you can use bacon instead. Just cook it or bake it up ahead of time and then mix it in with the veggies before you bake everything. When I lived in D.C for several months I got used to going to the nearby Aldi’s super market. They have great prices on so many things and one of them is prosciutto. I would buy it all the time! I think I paid $3.00 for an ounce at Aldi’s, which may sound like a lot, but everywhere else it’s about $8.00 an ounce. So it’s a super deal! Anyways, give this breakfast skillet a try and whip up some of my green chile sauce to pour over it. It’s an amazing combo! Let me know how you like it in a comment below! Check out my breakfast burritos or my breakfast casserole for other yummy breakfast ideas! 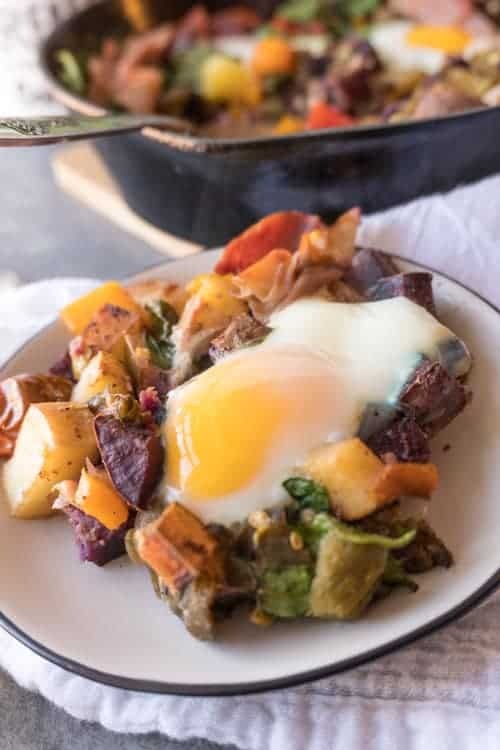 This sweet potato breakfast skillet is a fun and yummy breakfast to make! It’s a one pan easy breakfast, full of tasty and wholesome ingredients! Cut up the sweet potatoes, and all the other veggies. In a medium oven and stove top safe skillet cook, heat the oil over medium heat. Cook the potatoes for about 5 minutes. Season with garlic powder, salt and pepper. You want them to just begin to cook- but not be cooked completely. You will be cooking them more in the oven and over cooking will turn them mushy. Remove from heat and add in shallot, onion, bell pepper (if using), spinach, prosciutto, green chile (if using) and tomatoes. Stir for a few minutes letting the residual heat start to cook the veggies. Make 3 wells in the veggies and add an egg to each one. Place the skillet in the oven and bake until the eggs are cooked to your desired doneness. I bake mine for 15-017 minutes if I want a yolk that is barely runny. If you want a runny yolk try 9-11 minutes. I love to put salsa on this- so top with your favorite one and enjoy! *I love prosciutto, but it can be pricey, cooked bacon is a great substitute. I love green chile in almost everything! *I also like to make a green chile sauce and pour that over this dish- because I love smothering food in a tasty sauce! To make the green chile sauce check out the recipe here. *I used the little tomatoes that are different colors for this dish. They are typically sold as a variety pack in containers at the grocery store. Wow, you are right this recipe is so good and so healthy. I love adding it purple and white sweet potato, it will add the beauty of it and catch the kids attention. I love how adaptable this recipe is– a great way to use up fresh produce from my fridge. 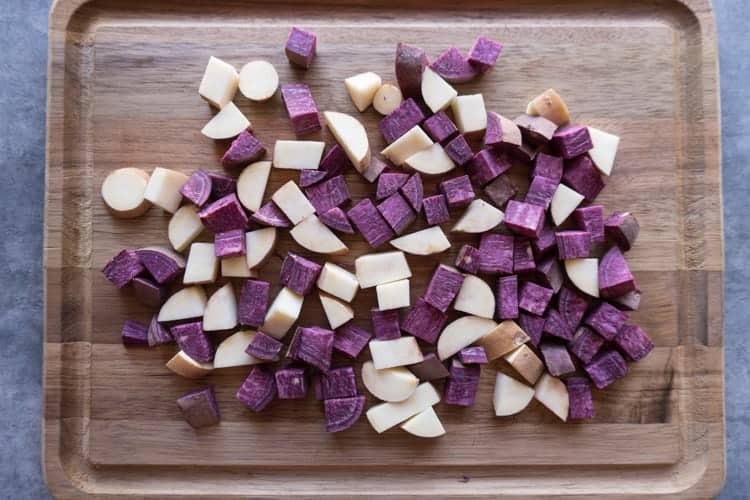 I’ve never tried purple sweet potatoes but I want to next time! The color is why I love them so much but they are just as delicious! Lisa, your blog is doing phenomenal!! I’m so happy to see all the great content you’re putting out! Wish you all the best! This skillet looks delicious!! These are very delicious tips!! Thanks Camila! You are so sweet! And you’ve helped me a to with your awesome posts! This looks so amazingly delicious and healthy! I love that you used prosciutto too! Can’t wait to try this! Prosciutto is my favorite! Thank you! I love the sound of this and it looks scrumptious. A great morning breakfast or dinner because I would so eat breakfast for dinner. I think I can actually eat it all myself. No sharing lol. Do you think beef bacon would work? I’m only asking because I don’t eat pork . Of course, I’d just cook it before hand then add it in to bake with the eggs. I like one pot dishes. They just simplify life. I am seeing all kinds of ways I can adapt this to my own dietary needs and preference.